Lockwood Folly Country Club is located just a short drive from North Myrtle Beach in Holden Beach, North Carolina. The Willard Byrd design course opened in 1988 and continues to be favorite among locals and tourists alike. Lockwood Folly is a links -style course that borders the Lockwood Folly River and wind through natural salt marshes and creeks. The fairways are lined with huge oak trees and towering Carolina pines. 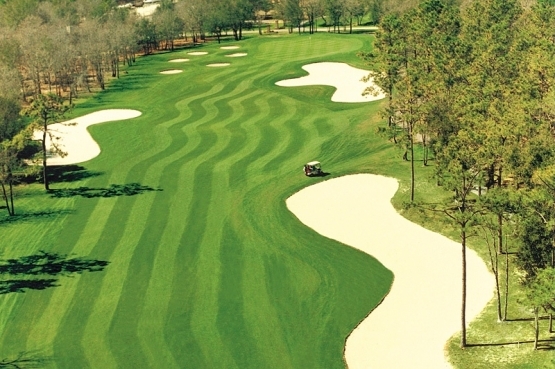 Strategically placed bunkering and natural hazards put accuracy at a premium on this Myrtle Beach golf course. This course is very playable for all skill levels golfers which will ensure a wonderful Myrtle Beach golf experience. If Lockwood Folly is on your list to include on your next Myrtle Beach golf package, you should consider North Myrtle Beach accommodations. North Myrtle Beach condos, hotels and beach houses would make your next Myrtle Beach golf vacation one to remember. Be sure to leave some time to take in some of the North Myrtle Beach attractions. There truly is something for everyone. Book your Myrtle Beach golf package today! I read the reviews on this course before playing. I believe that the reviews are very misleading. I was very disappointed with the shape of the course my playing companions felt the same way. The greens were very hard and had a lot of bare spots, putted very erratic. We also felt that the tee boxes were in need of some repair. I feel that the course in overrated and overpriced compared to other courses in the area. I know that I will not be returning for future play and would not recommend to anyone. The snack bar at the turn was closed and never saw a ranger to help with pace of play.